It is important to note that for Popper wasn’t so much concerned about truth, but how we get there. In his view, we cannot prove anything. But we can use a method of conjecting a theory, and then attempt to refute it. If it withstands these tests, there is probably more truth in it than in a theory that doesn’t. Popper used this to address the problem of demarcation, i.e. distinguishing between science and non-science. A scientific theory is any kind of theory that makes such predictions and the riskier the predictions are, the better the theory is. A non-scientific theory however does not make any risky predictions, and it is not possible to falsify it. Put together, this also means that a falsified scientific theory is still scientific, even if we may want to reject it on a factual level. However, an unfalsifiable theory is not, even if it is supported by all the evidence, because we cannot test it. This does not mean that it is factually wrong (although we cannot make any statements about this, because it is unfalsifiable). 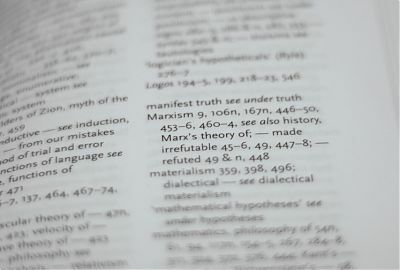 Newer editions of Conjectures seem to have addressed this pun, as the above picture from my 2002 edition shows: Marxism has been “—refuted” and is “—made irrefutable”. (emphasis added) I am not sure whether old editions don’t, quite possibly Lakatos and Feyerabend just brushed over this for the lolz. However, there is a serious point to make: As Lakatos and Feyerabend argue2, one of the weaknesses of Popper’s critical rationalism is, historically there can be considerable disagreement as to what counts as a falsification, and what we are supposed to do when one of many predictions of a theory fail. Thus, as Lakatos and Feyerabend argue, almost every falsifiable theory will be falsified at one point, but we may not (yet) wish to discard it. In reply, Popper conceded that scientific theories consist of a core hypothesis and auxiliary hypotheses, and these auxiliary hypotheses might be falsified without forcing us to reject the core. Instead, we may save the core hypothesis by suggesting a new, ad-hoc hypothesis. This solution however dilutes Popper’s critical rationalism considerably, and makes the stringent boundaries quite fuzzy again. Popper, Karl R. (1963) Science as Falsification (published in the 1963 edition of Conjectures and Refutations. 1 One might object that the Bolshevik regime does not represent what Marx considered as Socialism, but this has two pitfalls: 1) Why was Marx not able to predict this part of the history? 2) Such an interpretation also makes the predictions irrefutable unless it clearly specifies when and under which circumstances the ‘real’ Socialist revolution occurs. 2 I quote Feyerabend and Lakatos as if they were generally in agreement, but this agreement was largely restricted to their criticism of Popper. Their own positions were largely diametrically in opposition to each other. Whilst for Lakatos, there was at least some sort of progress, this notion was alien to Feyerabend: For him science had the same status as folk beliefs and neither one or the other brought progress that was worthwhile. Rather, we should believe whatever we feel is best for us, and remain sceptical over all attempts to describe the truth.